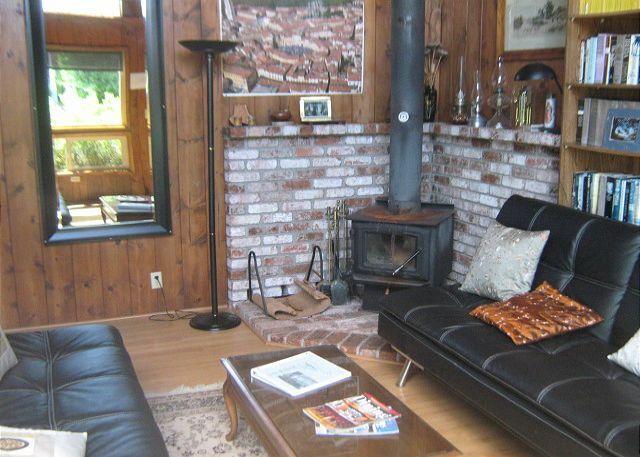 Wood stove & separate heater as well - nice ambiance and heat! Awesome Backyard with Paths and Views! Downstairs Bathroom with narrow shower only. Lighting is dim in shower, so turn on all the bathroom lights when using. Partial Ocean and Front Garden Views from Dining & Living Rooms. Enjoy sitting out in the front yard as well. 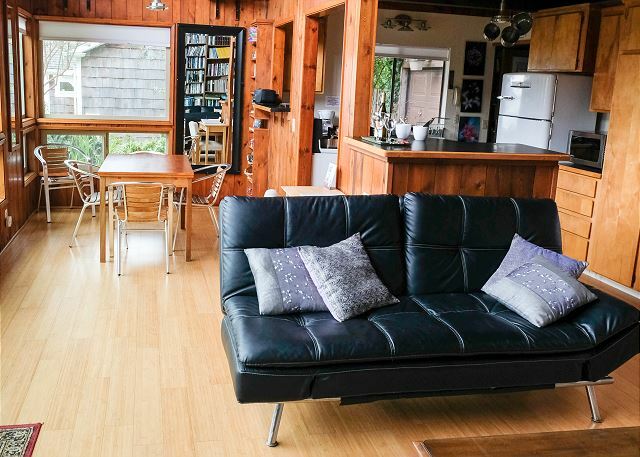 Crafted of heart redwood, WHALESoNG HOUSE is a charming two-story home with three cozy bedrooms, two bathrooms, a fully-stocked small kitchen with an adjacent dining area and a living room with a brick-surrounded woodstove fireplace. A designer’s delight, WHALESoNG HOUSE & GARDENS is lavishly landscaped with an enclosed, verdant, rear garden with multiple rhododendrons, climbing roses, hydrangeas, princess flowers, camellias and other perennials. Designed by one of the owners, the serene, sculptured, three-foot spherical fountain, Global Peace, which punctuates the dozens of heathers, lavenders and ornamental grasses in the front garden has become a Trinidad landmark. 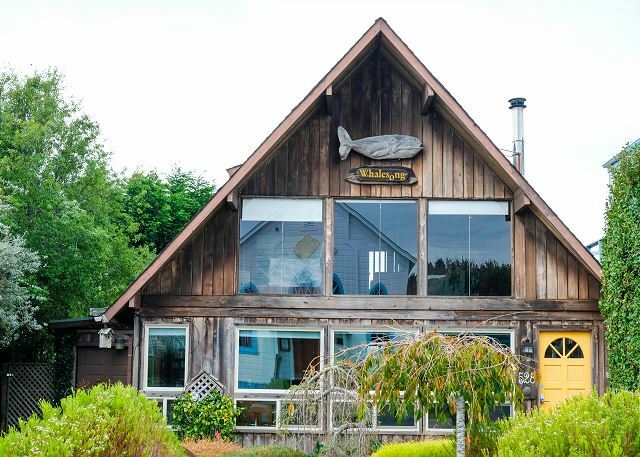 Byrd Baker, the “old timer” from Mendocino, who, in his small skiff, once blocked a Japanese whaling ship, carved the driftwood whale insignia, which hangs at the apex of the face of the house.Six people can be accommodated comfortably in the three bedrooms. All are dressed with luxurious down comforters. There is a cozy bathtub in the bright, upper bathroom and a narrow shower in the polished burl-countered lower bathroom. Complimentary bathrobes and linens are provided for each guest during your stay. The attached garage has been converted to a spacious storage and laundry room.The furnishings were chosen by the owners for their elegance as well as comfort. Some are precious, sturdy, family heirlooms. Original art and photographs are tastefully displayed in the rooms and hallways. Massive, antique architectural pieces punctuate the apices of the interior and exterior walls. The kitchen has a redundant supply of appliances and utensils including an automatic coffeemaker, microwave oven, a full-size 1954 GE refrigerator in perfect condition, a Maytag portable dishwasher, a four-burner electric stove, and various Cuisinart and other brand mixers, blenders and crock pots. Attractive cookware, service-ware and accessories are provided in quantity for your home-away-from-home comfort. The cable TV media room features a large TV and DVD player. In addition, there are many board games and puzzles for those quiet TV-free, intimate family evenings. You are only asked to treat them gently and return them to their locations. Our Trinidad homes have either exterior security cameras and/or routine foot patrol for your security and to ensure guest compliance. During HSU graduation and all major holidays, homes are monitored by routine drive-bys to ensure guests are complying to City Ordinances At no time may a vacation home in Trinidad be rented for the intent of hosting and event or party. If you are in town visiting for the purpose of attending an event or party, please ensure the partied is not carried over back to the home. Thank you. charming A-frame in the center of Trinidad. 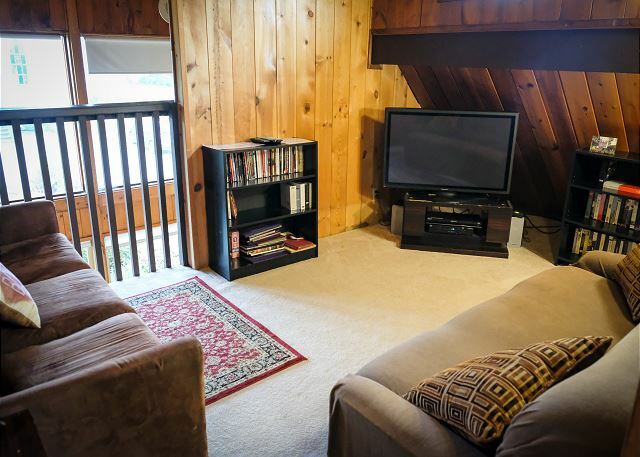 Warm and inviting, has a great view from the upper deck. Thank you for taking the time to write a review of the Whalesong House!I am glad the home was warm and inviting, and that you enjoyed the view from the upper deck. We hope you had a nice stay in Trinidad and please look us up again if you visit Trinidad or its surrounding area in the future. Overall, our experience was perfect. The house has an outstanding location and is very comfortable. 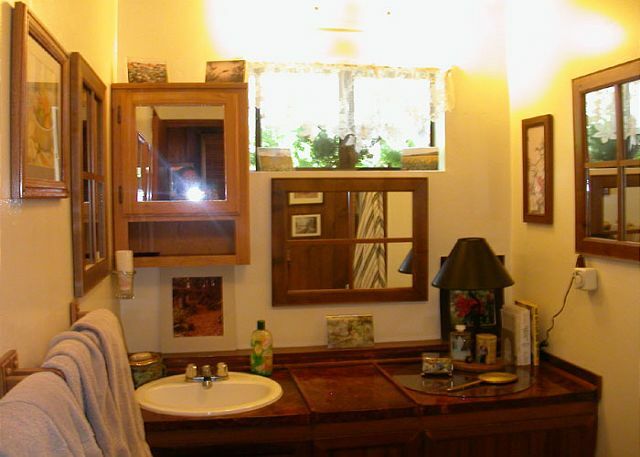 Bathrooms are a bit old, but workable. There was a problem with the water heater and the management company got someone out to fix it in a timely manner. Can't say enough about Trinidad as a beautiful vacation spot and the house was perfect for grandchildren and their parents alike! Thank you for choosing the Whalesong House for your Thanksgiving weekend, and for sharing that you had a positive experience with us. 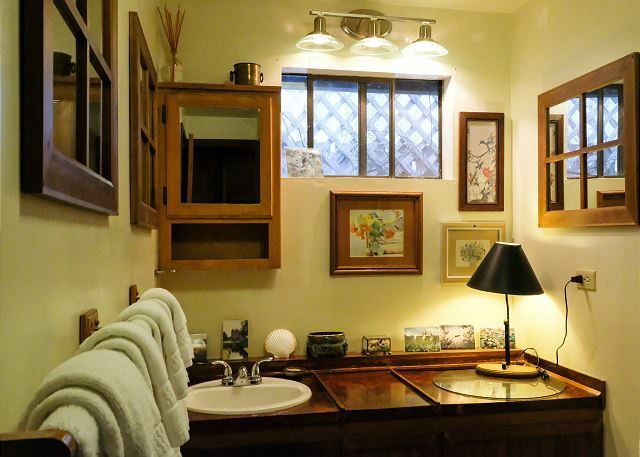 This is an older home, and the bathrooms are a little dated. Fortunately, the owners will be making modifications early next year. We do apologize for the hot water heater going out during your stay, but we thank you for your patience and understanding that sometimes things just happen, and we thank you for giving us the opportunity to address and repair the heater for you. Thanks again for leaving a review, please look us up at Redwood Coast Vacation Rentals when planning your next trip to the North Coast! The home itself is located in a nice spot, within walking distance of shops and the marina, and with a beautiful view. The home itself is fun and unique, with a serene backyard and hot tub, and a loft for reading and relaxing. We easily hosted a dinner party, the kitchen is well stocked and there is plenty of room to sit and enjoy the wood stove. A few updates would benefit guests, most notably the downstairs shower (there is a tub upstairs) which is very small. Certainly those few inconveniences are far outweighed by all of the wonderful attributes of this property. We thoroughly enjoyed our stay! I am happy to hear that you enjoyed the Whalesong House, the location and the kitchen was able to accommodate your dinner party. While the home is actually scheduled for a bathroom upgrade early next year, we do appreciate your feedback. It is through guest recommendations that we are able to improve our homes to optimize our guests' experiences. Thank you for choosing this home and for booking with us for your vacation. We do hope you will return to stay with us again in the future. Thank you for the review of the Whalesong House. It was good to hear that the home provided the right environment for you and your family. I appreciate the information about the missing salt shaker and sink stopper. I will replace those right away. We appreciate when guests not only leave a positive review, but they take the time to let us know that a few things are missing. We strive to provide the best, and often it is with feedback from our guests. Again, thank you for your recent stay and giving us the opportunity to assist you while you were at the home. 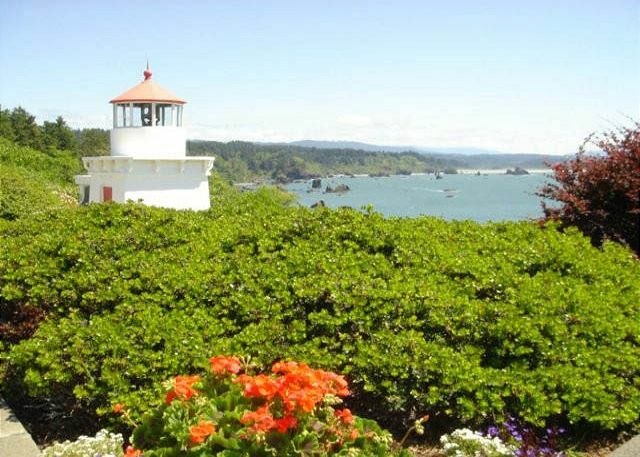 Thank you for your recent stay of the Whalesong House and Gardens and for booking with Redwood Coast Vacation Rentals. Please visit us again soon. Thank you for taking the time to write a quick review. We hope you had a nice stay and will visit us again on future stays. We were very happy with the property. It was clean and very close to the beach and the harbor. You are in walking distance of several restaurants and Murphy's grocery store for all your needs. If you like to hike, there are several easy trails to walk to see the ocean views and the seals that are resting on the rock islands. The only thing that I could complain about is the house does creak and sometimes a little noisy when you walk upstairs but it is an older house and is to be expected. 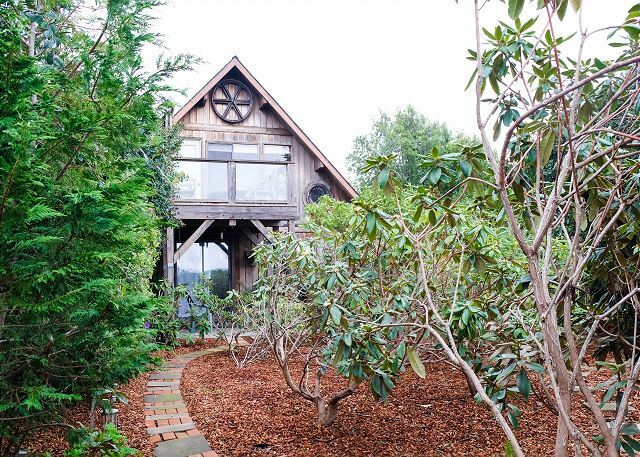 The Whalesong home is an older home, but it is in a wonderful location in Trinidad for visiting the beaches, being close to the redwoods, and for simply walking around town enjoying what our little city to offer. I was glad to hear you were happy with the home and it was a good fit for you and your family for your stay. Thank booking with us and making us a part of your vacation. Thank you for your recent stay at the Whalesong House and Gardens! Great place to stay. Management team very responsive. It far exceeded our expectations. I highly recommend whalesong. Thanks for this magical retreat. Love the title! Thank you for enjoying the Whalesong House and gardens and for booking with Redwood Coast Vacation Rentals. It is always a pleasure to know that the home exceeded expectations and we do hope you will return to visit us again soon. 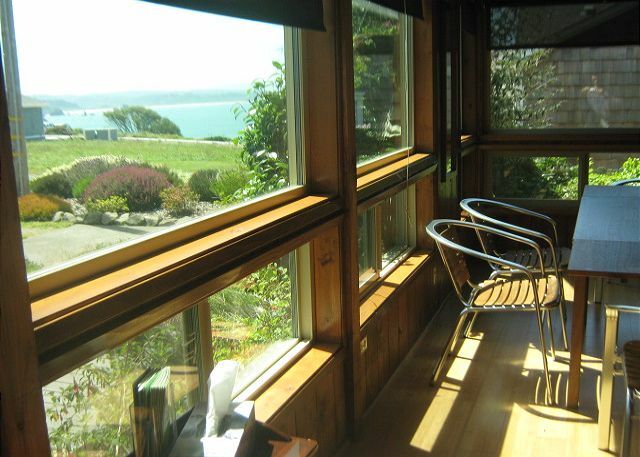 Thank you for your recent stay at the Whalesong Home & Gardens, and for booking with Redwood Coast Vacation Rentals. We hope we will have the opportunity to accommodate you again for future stays. Family vacation to Trinidad. This house is great! Great location, great views of the ocean. Could not have asked for anything better. Thank you for the review of the Whalesong House. This is a great home, in a great location for family vacations. We hope you will return for many more vacations to come. Lovely spot in Trinidad. Very Cozy and Unique. Highly Recommended! Happy belated birthday! Thank you for choosing the Whalesong House for your special occasion and for booking with Redwood Coast Vacation Rentals. This is a very cozy home, located in a great location for exploring Trinidad by foot; So glad to hear that you enjoyed your time there. We hope you will return to stay with us again, on many other occasions. Thank you for choosing the Whalesong House and gardens and for booking with Redwood Coast Vacation Rentals. We wish we could have stayed longer! We didn't even get to use the hot tub, but it was a perfect place for us to host out-of-towners for my daughter's wedding. We also enjoyed our walk around town. So glad you enjoyed the Whalesong house for your guests and what a special occasion! Maybe a staycation getaway is in order soon, to come back and enjoy the hot tub. Thank you for choosing this home and we look forward to having you back again. It's a beautiful house with a great, clean hot tub. I stayed in the room upstairs. The bed was incredibly soft, which to me is uncomfortable. Also, the carpet was very dirty. I also thought that a 10:00 am checkout was incredibly early for an expensive property. Otherwise, the house and the stay were very nice. Thank you for your recent stay at the Whalesong House. We work very hard to make our homes comfortable and we are sorry to hear the bed was too soft for you. While the carpets do have some stains, they are cleaned between every guest and routinely professionally clean. I will definitely look into whether a sooner clean is necessary. Thank you for the feedback. Overall, we really enjoyed this unique and homey space. We've never stayed in a place that was actually someone's vacation home, so we didn't relax as much as I think we could've, but still it was a perfect spot to stay. A couple of suggestions: A screen door or some window screens on the upstairs door to the patio would be nice because it gets extremely hot. Also, there seemed to be lots of spiders; my daughter saw a bunch in the twin bedroom and we each got a couple of bites during the night. I had 2 huge bites on my arm. But those are fixable things. Overall, we really enjoyed this place. Whalesong House is definitely unique and homey. thank you for the suggestions of the screens on the windows. During the days of your stay we had unusually warm weather, and as such, most homes in our area do not have screens as it generally does not get hot here. While the locals were loving the heat, it may have been a bit much for those coming from out of the area. Here in Trinidad we have a plethora of spiders. Primarily this time of year and through Fall. They are everywhere and on all homes and forests, but most are very harmless. There are very few that are problems and they are rarely seen. We will definitely keep an eye out for unusual activity and treat if necessary. Thank you for pointing them out to us. We do hope your stay to our area was otherwise fun and adventurous and we are glad you enjoyed the home. We do hope you will visit again and feel more comfortable in our homes. So glad you enjoyed the Whalesong House for your stay. Great location, close to the ocean, and beautiful garden out front. The loft area has served for the TV room for some time, and people have enjoyed the view out the windows from there. Unfortunately, we are unable to move the TV downstairs for lack of electrical outlets, but we will definitely consider some options. Thank you for your feedback. My family was visiting Humboldt for a joyous occasion, the wedding of our son. Staying at Whalesong gave us the perfect balance of attending large festivities, and having such a comfortable home to return to. 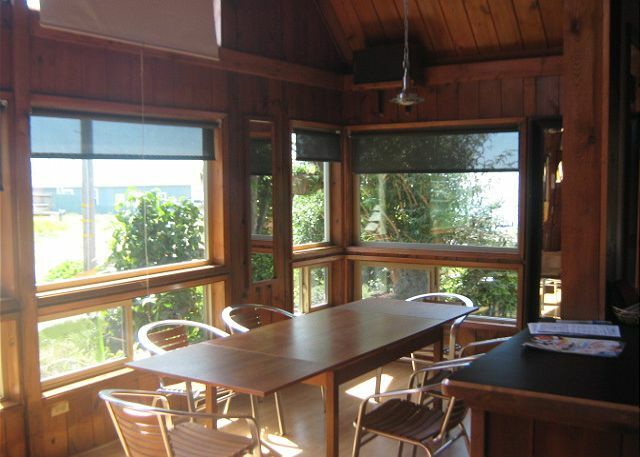 Located above beautiful Trinidad Bay, and a few minutes walk into town, it was the perfect home away from home for us. I highly recommend Whalesong and appreciate the good service we got from Redwood Coast Vacation Rentals. Congratulations again to your son and his new bride. We love hearing that our guests not only enjoyed the house, but made fond memories while at their stay in our homes. Thank you for choosing the Whalesong House & Gardens and we hope you will return for many more special occasions to come. We came from three separate cities and stayed together at his home, and it was perfect. 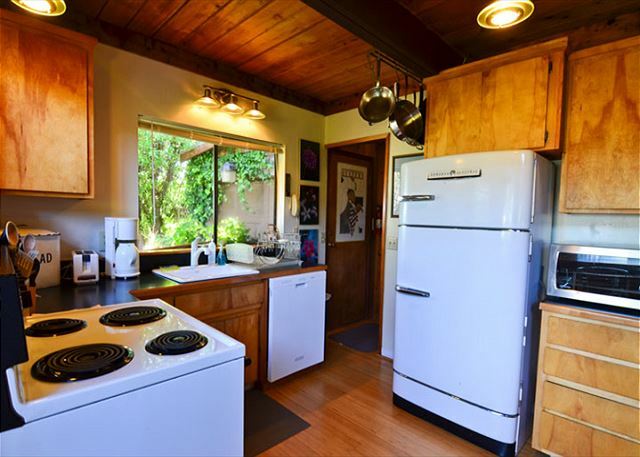 Very comfortable, well stocked kitchen and close to groceries and good restaurants. The views, beach and Trinidad head were gorgeous. We day tripped tonredwood hikes. Beautiful area and totally memorable vacation! The Whalesong House is popular place to stay in Trinidad and I am pleased to hear that it was a good fit for you and your family gathering. The location makes it nice to access most all of Trinidad by foot and having some ocean views from the property is a treat. This area is so beautiful and scenic, it is good to hear that you were able to go our and enjoy the redwoods. Thank you for staying with us and we hope you will visit us again soon. 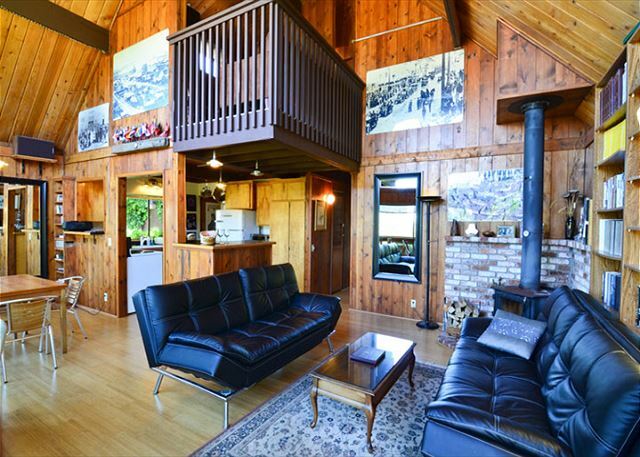 This house was perfect for my family's trip to the Redwood forest! It had amazing views, plenty of sleeping space and lots of thoughtful extras. It was conveniently located near a great cafe (within walking distance) and a grocery store. I would highly recommend! Thank you for the review, Sheri! You are right about this home being in a convenient location. It was walking distance to nearly everything in Trinidad. Thank you for choosing this home and I hope you will return to visit us again soon! This was a great location. We could walk to several restaurants, the grocery store and the beach. Wonderful views. There were six adults staying at the house. We all slept very comfortably. Had everything we needed. Whalesong House is probably in one of the best locations in Trinidad. It is centrally located for easy walking access to beaches, shopping, dining, and so much more. I am pleased the home was comfortable and had everything that you needed. Thank you for booking with Redwood Coast Vacation Rentals and we hope you will return to visit again soon. If you're looking for a little shoreline getaway this is it! Loved the area, very convenient location to shopping, restaurants and more! Glald to hear that the the Whalesong House and Gardens was a good fit for you. Can't beat the location, close to ocean and shopping; it is such a convenience for anyone visiting our area. 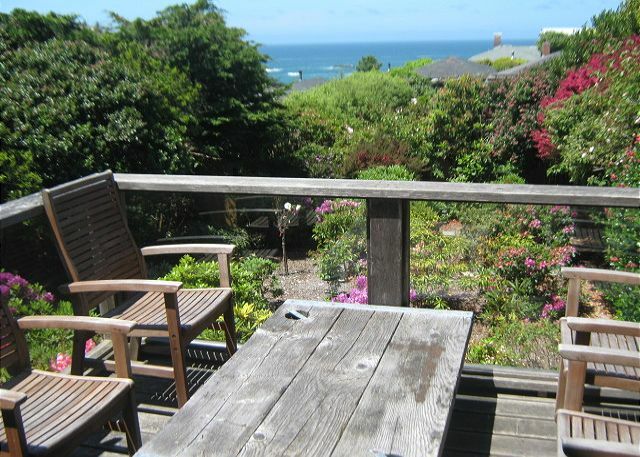 Thank you for choosing the Whalesong House and for booking with Redwood Coast Vacation Rentals. Please visit us again soon. Love Trinidad and love this place. Five of us from all over the U.S. found this perfect place. One guest loved the hot tub. another loved the beautiful loft bedroom with a lovely view of the Pacific, and another loved the view from the kitchen to the shoreline. I loved all of this place. Accommodations were very clean and comfortable. We definitely will stay here again. Thank you for providing such a cozy and inviting home. Wow, what a treat to have an array of guests at the Whalesong House, and to enjoy so many different aspects of the home. This is definitely a unique home and thank you so much for sharing the things about the house that you enjoyed. We definitely hope you will return to visit us again. We had a great time at Whalesong. The house was comfortable, well equipped and clean. Would stay thee again. Thank you for your review of te Whalesong house and gardens. Please visit us again soon. Even though the property manager told us this was an "older" property I was really impressed. The bed was so comfortable and you can literally see the ocean from the upstairs bedroom. Everything was within walking distance and very centrally located. The only thing missing was some kindling to start the hardwood stove which we picked up from the store. The retro fridge was a really neat item to have as well, reminded me of a time long ago. We had quite a few flies in the upstairs bedroom. Not sure where they were coming in from since all the windows were shut, but that was easy to handle. Overall this house is well equipped with all the necessity's you need, close to everywhere you might want to go, and has the best views! We will definitely book again if we are ever back in the area. So glad that you enjoyed your stay at the Whalesong house, and that you were impressed with the home. The reference to "older" was only in comparison to the other home being considered at the time. This home is really in a great location for enjoying Trinidad and for ease of getting around Trinidad by foot. We look forward to accommodating you again in the future, and thank you for your recent stay. The "Whalesong" was rented as part of a scientific conference and housed 4 scientists for 4 nights. All were comfortable and satisfied with their accommodations. Thank you for staying at the Whalesong House and Gardens. I am glad to hear that the home was comfortable and satisfying for all of you. I hope you will all have the opportunity to visit us again, for conference or for enjoying our scenic north coast. This was our first visit to Trinidad and we loved the experience. Surely we will be back! The house was perfect for our needs and was comfortable. It is centrally located to almost everything in the town. We enjoyed walking on the beach, hiking to the cross, having clam chowder at Seascape Restaurant, and drinking pumpkin spice lattes at the eatery up the street. We very much enjoyed the upper deck off the house; we watched the sunset there every evening. The only drawback I can think to mention is that the house only has one shower and it is quite small. The upstairs bathroom only has a tub. This should be mentioned in the write up about this house (if is isn't already). Also, the downstairs bathroom did not have a shade or drape to cover the window and you could see right across into the neighbor's window. I hung a towel there temporarily while I showered every day. Also, the back gardens look like they could use some trimming. A lot of the plants seemed overgrown. All in all, we very much enjoyed staying here and would do so again in a heartbeat. Thank you for the review of the Whalesong House. I am so glad you loved it and we hope you will be back. Funny you mentioned the garden, the gardener was away and returned the day of your departure and began working away. Plants are being pruned, many removed, and new ones being planted, so it should be all pretty again should you choose to visit again. Thank you for mentioning the window in the bathroom. We will put up a curtain rod and curtain this week. Again, I am happy to hear you enjoyed your time in Trinidad, walking hiking, beaching, etc. It is such a beautiful town. Please visit again. This is a great rental! Perfect location, as you can walk to everything! Great ocean view! We will be back! We look forward to having you back to the Whalesong House and Gardens. We have some upgrades scheduled for the fall, so when you return, we hope you will enjoy the changes. This is wonderful home in such a great location, what a treat. We look forward to seeing you again soon. The Whalesong home was perfect for a long overdue reunion with my brother and sister-in-law. We were right at home right away. We loved everything from the accommodations to the location. Only wished we could have stayed longer. Please do come again! We are happy to hear that you had a good time. We love the convenience and comfort of the Whalesong home too! We lour stay at Whalesong! We had 4 adults, and 2 children and the house was a great fit for our needs. We were able to go different short hikes right from our front door, walk to the restaurants, and grocery store. We were right at the ocean and the children enjoyed climbing all the rocks and even seeing seals basking themselves in the sun! Another great plus for us were the great selection of books at Whalesong. We read book after book to our kids and we still probably did not even make it through half the collection. What fun! The house was perfect for 2 families, with enough privacy for each, but a wonderful living area where all could mingle togehter and the upstairs loft was great to take a break in if you needed a little reprieve. The house was clean, beautiful and very welcoming. Beautiful view also. Easy drive to the Redwood forest. I would certainly be a return customer, if our travels take us that way again. Thank you, for making a wonderful vacation possible!! You are Welcome! It is good to know that you had a great stay. As you mentioned Whalesong Home is both convenient and comfortable. Stay with us again when you return. 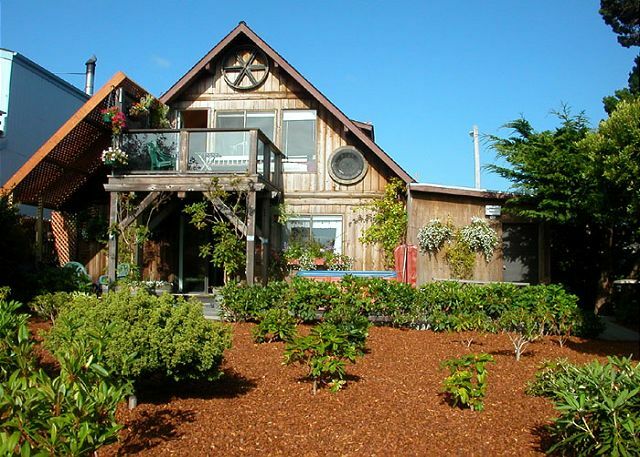 Redwood Coast Vacation Rentals thanks you for your stay at the Whalesong House and Gardens. We are so happy you enjoyed our rental and our wonderful city of Trinidad. Please visit us again! What a wonderful place to vacation. This place had enough books to inspire anyone of any age. Great amenities, we really felt like we were welcome and we were able to just relax. Thank you for the review Victoria! Whalesong is such a cozy house, what a great place to relax at! So happy to hear you had a wonderful time, Redwood Coast Vacation Rentals thanks you for your stay, and we look forward to having you visit us again! Location is perfect! It's in a beautiful neighborhood with amazing views of the water and lighthouse. You can easily walk downtown or to the beach. The house was charming and quirky, backyard was full of flowers. We loved our stay! Only thing to note-- it isn't actually 2 bathrooms. One bathroom only has a bathtub (no shower). The second one has a shower (no tub). The one shower is a VERY small stall. Besides that, we absolutely loved staying here. Thank you for taking the time to leave a review. The Whalesong House is definitely in a perfect location. I love the gardens! You are right about the bathrooms. 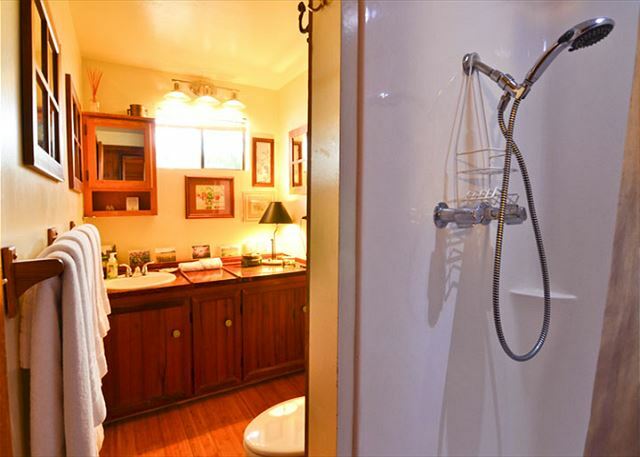 It is hard to list because it does have two "bathrooms", one is just a shower and one is just a tub. We will work on how to word, so thank you for mentioning. I am glad you loved staying there, though, and I do hope you will return to stay with us again, here with Redwood Coast Vacation Rentals. We thoroughly enjoyed our stay at Whalesong. 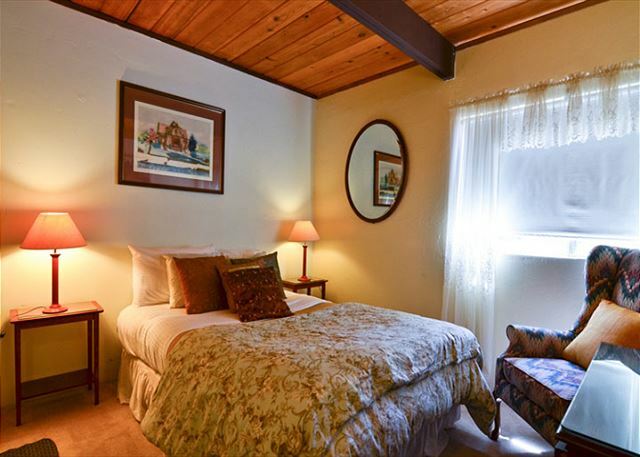 It is an ideal home base for exploring the Redwoods in the area. Comfortable and relaxing. Glad you enjoyed your stay at the Whalesong House. Redwood Coast Vacation Rentals thanks you for your stay and we hope you will return to visit us again! House was great. It should be noted that although the description is 2 bath. It's really only 1 1/2 bath. There is only one phone booth size shower. however, we would stay there again. Thanks for the review of the Whalesong House. I will look into rewording the bathroom description. I am happy to hear you would stay there again, the home is in such a great location! Thanking you for staying with Redwood Coast Vacation Rentals and please visit us agin. Great location. 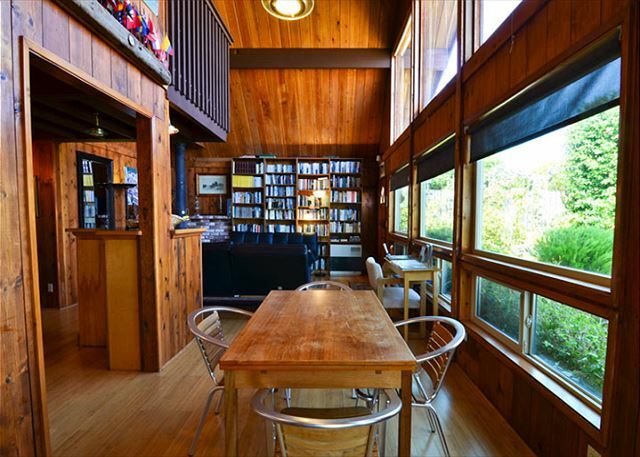 A lovely house with library, hot tub, yard, view and gourmet kitchen. Whalesong house is truly in a great location in Trinidad. I hope you had a lovely time while staying in there, and I hope you will return to Redwood Coast Vacation Rentals again in the future. First time to the Redwood Coast and considered ourselves fortunate to have decided to stay in Trinidad, what we now consider the best location in the area (easy access to beach trails, adequate restaurant and food options, and short drives to many outstanding additional attractions, beaches, etc). The Whalesong was perfect for our family of four with plenty of room for everyone to spread (in or out) but also spend cozy time together eating, playing games, and watching movies. This house built in the early 70's so don't expect perfection (although the house and gardens are clearly very well maintained), but do expect charm. House could easily accommodate more than 4, but single small shower might be a challenge for larger groups. Kitchen is well stocked and rest of house has just about everything you'll need for a comfortable stay. 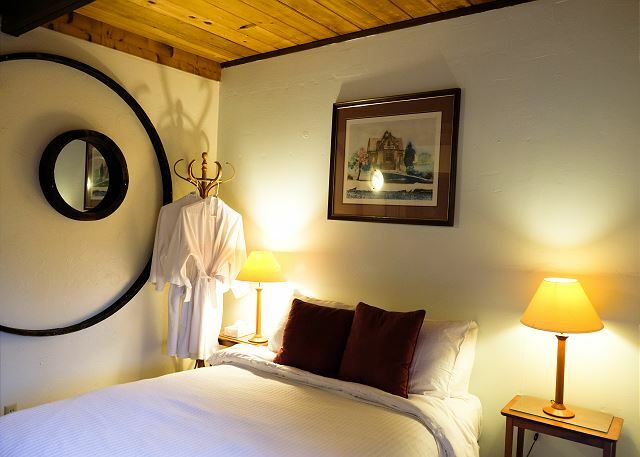 Thank you, Martin, for the review of Whalesong House. I find this home to be quite a gem myself. Almost couldn't ask for a more convenient location and I love the garden. We are very pleased you enjoyed your stay here and I do hope you will visit us again, here with Redwood Coast Vacation Rentals. excellent spot. very child friendly, clean, well organized and fabulous location -- walk to cafe, beach, etc. Whalesong House definitely is in a great location and is a warm and friendly home. 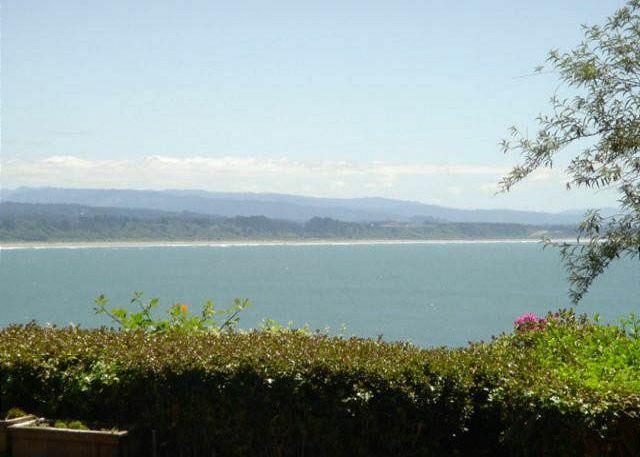 Thank you for choosing this home and for staying with Redwood Coast Vacation Rentals. Thank you for staying at the Whalesong House. Please visit our area again and check out one of our many other vacation rentals Redwood Coast Vacation Rentals has to offer. Thank you for your recent stay at the Whalesong House. Please visit again in the late Spring and enjoy our beautiful gardens. Great experience. The house is great and the location is spectacular. Our son had a fantastic time exploring in the gardens and walking the short walk to the beaches. Thank you for the review of Whalesong. It is an enjoyable house, at really a great location close to so much of Trinidad by foot. Hope you will get a chance to stay with us again. We enjoyed our stay at WHALESoNG very much! You just can't beat the location and views. We were able to walk to restaurants and beaches. Loved the little art gallery up the block too. It was the perfect home base for day hiking in the Redwood Forest. The only negative was that the bathrooms were very small and there is only one shower. All of us had to duck down to rinse our hair...I guess the shower was made for folks under 5'6". While the gardens are quite lovely, they are far more overgrown than the pictures show. You cannot really walk through them and appreciate them up close. Glad to hear you enjoyed your stay at the Whalesong House while visiting Trinidad. What a cozy and convenient place it is, very accessible to much of Trinidad by foot. The home is quite older and unfortunately there is little we can do to make the bathrooms bigger, but I hear what you are saying. I hope you will come visit us again. Thank you for staying with us. Whalesong is a cozy home and Trinidad is an amazing little town, it is hard not to want to stay longer. You will have to just come visit us again! We stayed at Whalesong this passed weekend while visiting our daughter at HSU. The property was clean and the location was perfect. The hot tub was not working when we arrived but the property managers were already working on it. In fact, they replaced the heater! Dori contacted us to make sure the tub was working and was very professional. We would recommend this house and would stay again! Thank you for the review of Whalesong House. This is a fun house in a wonderful location accessible to so much of town. I am pleased we were able to get the hot tub working so promptly, as we do strive to give our guests a wonderful experience. I do hope you return to visit us again, if not at this house, maybe one of our many others here at Redwood Coast Vacation Rentals. Whisked our daughter away from HSU for some well deserved R & R! This property was perfect. Trinidad is peaceful, charming and ideal for walks on beach! MBR is like like sleeping in a treehouse! Only view is horizon and treetop! Private hot tub is secluded and the book and movie library is extensive ! I am pleased to hear Whalesong was a perfect getaway location for you. It is definitely quite the charming house. I hope you will get the opportunity to stay with us again. Very nice, well located home However, interior was rather dark and one of the three bedrooms was small with twin beds. Overall a lot of fun. Very pleased with property management company. Thank you for the review of Whalesong House, I am glad to hear you had a lot of fun. This is a very popular and cozy home. I will look into seeing if we can get an extra floor lamp for some additional lighting. 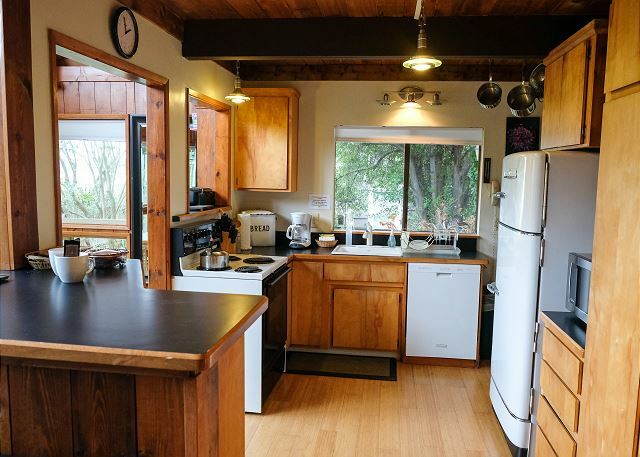 Here at Redwood Coast Vacation Rentals we have over 50 vacation homes in varying environments to suit all tastes, so please consider one of our other homes, as well, if planning on returning to the area. We look forward to having you again. I felt as at-home in the Trinidad vacation house as in my own home. It was so well equipped and comfortable. What truly impressed me, was when I had thought I had left a pair of sandals behind, staff did all they could to look for them and get back to me. It turned out they were stuck in a place I hadn't looked. Thank you so much. Thank you for the review of Whalesong House. This is definitely one of those homes that you automatically feel comfortable in, as if it were your own. If you ever get a chance, you should definitely come when the garden is in full bloom. It is quite amazing! I hope you come stay with us again, here at Redwood Coast Vacation Rentals. If this home is ever booked, we have over 50 other vacation rentals that I can share with you, that will make you feel quite at home as well. Hope to see you again, thank you. We loved this location! Beautiful sunsets and convenient walk to the grocery store. Spent the days exploring the beach, Redwood National Forest, and Patrick's Point tide pools. So quiet it took some getting used to (we live in the city :-) Easily fit 2 adults and 3 kids (ages 9,11,13). Sounds like you had a peaceful time during your stay, exploring the beaches and parks. Getting a chance to go tide-pooling is really such a treat! 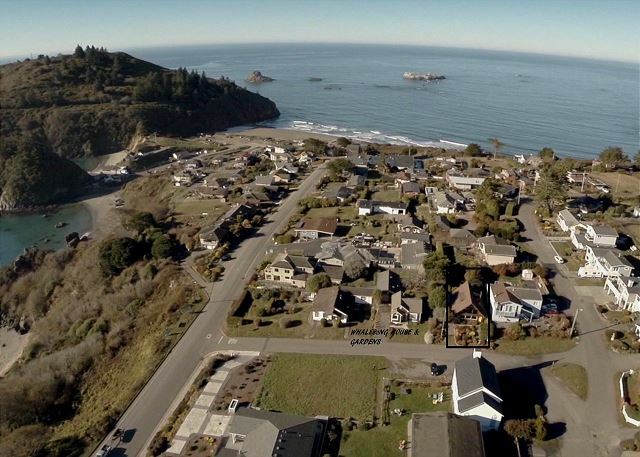 Hope to have you back soon to the Whalesong House managed by Redwood Coast Vacation Rentals with over 50 homes from Crescent City to Eureka including Trinidad, Arcata, Orick & the Redwood National Park & now even Willow Creek on the Trinity River. It was good working with the management company. The house is sweet and very well-equipped. However, the bedroom carpets need heavier cleaning or replacement, especially upstairs, the kitchen sink leaked, and the upstairs toilet ran constantly. I think the oven thermostat may be off. We had to cook food much longer than at home. If I recommend this place or return, I would assume that these things would have been remedied. It was lovely to arrive to wine and flowers...thank you. Glad you enjoyed the house. Yes, we just replaced both toilets - they were special order because of the plumbing used and the first ones that were arrived were wrong size. All good now. Kitchen sink leak has been fixed as well. We do get the carpets professionally cleaned on a regular basis but some stains cannot be removed. We will look at options on that. Yes, older oven but will have that thermostat checked on. This is the first time it has been mentioned. 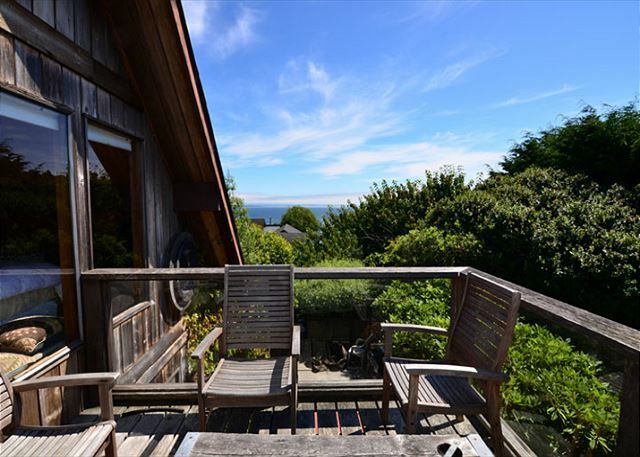 Hope to have you back to the Whalesong House by Redwood Coast Vacation Rentals - one of our 50 vacation homes on the Redwood Coast. We loved this home. 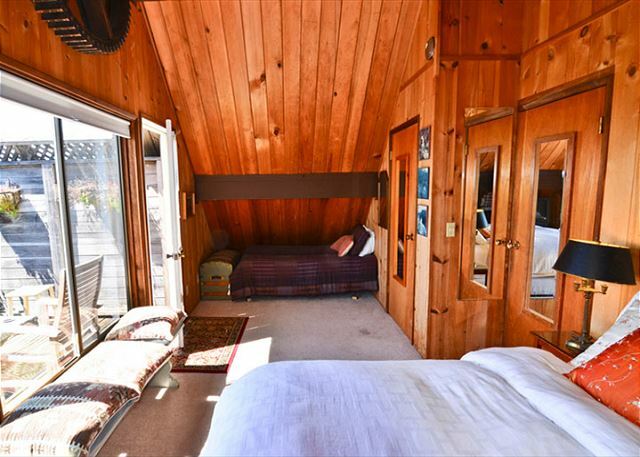 The A frame design and knotty pine walls make it a unique and special space. Loved the flowers which hung from baskets in all areas of the gardens. The location can't be beat. Loved being able to walk to the many beaches and to the pier. Our only complaint are there were not enough cleaning supplies and the running toilets. There were no sponges or rags for dishes nor was there laundry soap. There were paper towels but no windex or cleaner to wipe down counters or glass coffee table, which did need it after a three day stay. Also, the toilets ran constantly. They could be fiddled with to make them stop, This was ongoing. In saying that, we loved this house and hope to stay here again soon. A perfect beach get away. We are really glad you loved the home and it's location! Yes, walking to the beaches and things that the town has is great! We just had a company come in and "fix" the toilets so we will have that repaired properly. In regards to your comments about cleaning supplies, we had rags there for you in the drawer by the sink but you must have missed them and we also have wash clothes with mesh scrubbers instead of sponges that we're trying out that were in that same drawer. We don't supply laundry soap but they sell small boxes of it at the store. Thank you for your feedback as it is helpful in making every stay the best experience possible for our guests with Redwood Coast Vacation Rentals. Once again, glad that the house was nice for you and that you enjoyed Trinidad! We were originally booked in another property. Upon arrival, we found that place to be unsatisfactory and asked to be moved to a new property. The property mgmt company was great and booked us at a new location in less than an hour. We were very pleasantly surprised at what we found at Whalesong House and Gardens and were so grateful to spend the first few days of our honeymoon there. The location cannot be beat and the views are amazing! The house is somewhat older, but everything was in good working order and the beds were comfortable. The new hot tub/spa is a great addition to the property and we also spent many nights out on the balcony. The landscaping is gorgeous and we particularly enjoyed the hummingbirds and other wildlife. We would definitely stay at Whalesong House and Gardens again. I AM FROM HONDURAS AND THERE ARE STILL SOME PARTS OF THE WORLD THAT HAVE NOT BE TOUCHED BY PUBLICITY. OUR STAY WAS THIS PLACE.. QUIET AND BEAUTIFUL BEYOND ANY WORD THAT IS NOT IN THE DICTIONARY. 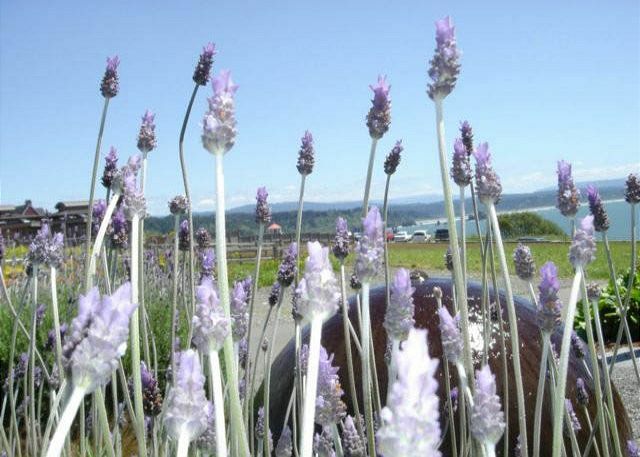 FROM THE LAVENDER GARDENS TO THE COMFORTABLE ROOMS AND BACKYARD FLOWERS. IT IS WOW WAS MADE FOR US TO FIND AND DISCOVER. EVEN OUR YOUNG ADULT CHILDREN (19) ARE LOOKING FORWARD TO GOING BACK. WE LIVE IN PONCHATOULA, LA. STRAWBERRIES, FRIENDLY FACES. THIS PLACE WAS EQUAL AND THE NEIGHBORHOOD SITES IS A KISS TO THE CHEEK CLOSE TO HEAVEN! THANK YOU FOR A RETURNABLE DESIRE THIS HOME LEFT FOR US! GOD KEEP IT PROTECTED! You are right, a lot of people still don't know about the Redwood Coast or Trinidad. You picked a great time of year with good weather and not crowded (not that it ever really is). Really glad you enjoyed the WHALESoNG HoUSE & GARDENS with Redwood Coast Vacation Rentals. This is one of 40 plus rentals that we manage with plenty of variety. I will have to vacation in your hidden gem in Louisiana some time! Private, cozy,happy with beautiful gardens and bird watching. Great to hear! Graduation week at Humboldt State University is such an exciting time for so many people - we are glad to offer the home to help make this special time perfect! I like your "happy" description. 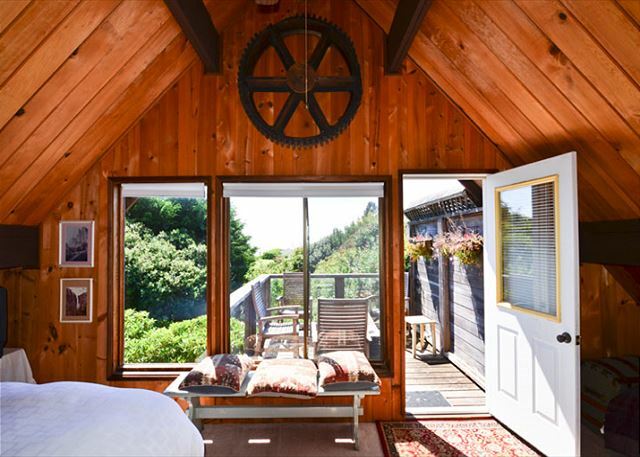 We hope to see you again at the WHALESoNG HoUSE & GARDENS managed and marketed by Redwood Coast Vacation Rentals with over 40 rentals from Eureka to Redwood National Park. the weather was great...loved Trinidad..toured around (redwoods,Ferndale, Eureka) Whalehouse was perfect. We had a very good time at the Whalesong. A beautifully located bungalow with a nice garden, fully equipped kitchen, hot tub, fantastic views, proximity to beach and restaurants, well stocked book and video librtaries... It had it all. Probably the highlight of our SF-Seattle drive. Wow! You must have done many wonderful things on your trip between SF and Seattle and it is really nice that the Whalesong and Trinidad was the highlight. Come back again. It was the 50th wedding anniversary for my parents. My Sister and her Family of 6, our parents and myself with a companion all enjoyed the weekend comfortably together at this wonderfully comfortable yet unpretentious seaside home. I would do it again and recommend it to anyone with a large family looking for a relaxed getaway weekend. Wow, 50th Wedding Anniversary! Thank you for choosing us for your venue of making more memorable family times. Nice house located in the center of it all in Trinidad. Easy walk to both the grocery market and the ocean. It's less expensive asnd much more convenient to rent a house--with laundry, kitchen, etc.--if you need two or three bedrooms, than to rent hotel rooms or even to stay at a B&B. I'll go for the house rental everytime, if available. Whalesong was homey and comfortable. We loved the area and would recommend his vacation property. Thank you! Really glad to hear! I'm sure you enjoyed the book selection too. Whalesong was a very nice place to stay. Conveniently located to the beach. Everything you needed to cook meals. Adequate linens. Lots of books to read and relax with. Hot tube was very nice during the evenings after you are done with the sightseeing. Lots of radios in the house but only one worked. House needed to be deep cleaned. Lots of webs and dust in the high up locations. Overall enjoyable and would not hesitate to stay there again. Thank you for your review. We actually deep clean all our houses on a regular basis. The challenge is that sometimes the webs or dust come quickly in the really high places. My husband and I had a fantastic time at Whalesong House during our very short visit. We only stayed two nights, and unfortunately did not get to test out the jacuzzi due to a power outage affecting the entire small town during the second night of our stay. Thankfully, there was a functioning hurricane lamp on the fireplace mantel for us to use and find our way around the house. Looking forward to planning another trip in the future, and bringing a few friends along to enjoy it with us. Lovely place, but chilly weather and the space heaters were not sufficient. We built a fire in fireplace, but only after having difficult time finding kindling and no hatchet available! In the warm season, this property is great. Thanks! Yes, the heater ignitor broke (but the company came out next morning and fixed it) and it takes awhile for that heater to heat the house up. Once it was fixed, it worked pretty well. We generally turn it on in the morning of the guest arrival date so the whole house is warm upon your arrival. Will make sure to have kindling there for you so you don't have to use a hatchet. I will remember the sunrise glow around the church on Christmas morning! There were some maintenance problems, but response was quick and effective. Our vacation in Trindad was exceptional. The location of the property is ideal, the amenities were acceptable and the scenery was great! There were no issues at all with this property based on our needs. I would suggest replacing the TV with something that works better in the loft area and the radio in the living area did not work. However I came there to relax, catch up on reading (and this house has more books that a municipal libraray) and go for long walks. The wood stove worked great, the kithen has everything you need, the linens were fine, and Mike was very helpful for the few questions I had. Being from Carmel, I found Trinidad by accident and have to say its the perfect place to relax and enjoy time in a small beach community where you will hear nothing but a bouy bell at night. It was a memorable stay! Wonderful time, beautiful location, great lodging, we will return! Was a great location. Home was clean with everything needed for a pleasent stay. needed. Interesting furniture. Landscaping was nice and enjoyed having wood for the wood stove. Other stove in livingroom not very efficient. All things negative did not stop us from enjoying our stay but could be taken care of. We would rent the house again. I thought it was priced right for our stay. Your office did a good job handling the rental. Yes, we fixeed the fan, replaced the broken blinds, and fixed the toilt seat just after your stay. The lock box is sticky so we will replace it. 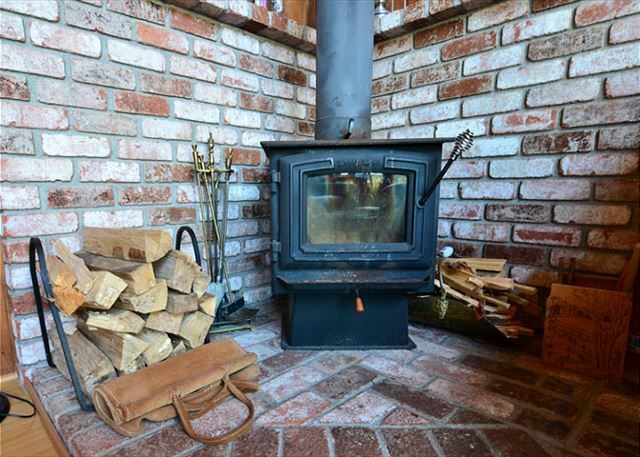 For heating we have a wood stove and a large heater. They warm up the house pretty quickly, either on their own or together. Hope to see u again. Great house, cute location, gorgeous surroundings. only complaint was that some of the amenities were a little odd (broken cd player; confusing controls on the jacuzzi). otherwise flawless. we will replace cd if it is broken. Glad you loved it! Come on back! Our family of six had a great time at the Whalesong house. The views from the upstairs balcony were wonderful and the visiting birds to the front yard were entertaining. We didn't want to leave and would stay here again. There are some things that need repair but overall the house and amenities are great. Nice selection of saucepans and cooking utensils, a working hot tub, great BBQ. Our stay at Whale Somg was wonderful. Although we were on the run with graduation activities we thoroughly enjoyed the house, the incredible views, and Trinidad while we were there! Can't wait to return just to enjoy and explore! This was are second year to rent this house. Great location for the Clam Beach run. Can walk to everything we need to get to. The only problem with this rental is the size of the shower, if your short and not to wide it works great, but if your a bigger person it is a challenge to shower. Enjoyed our stay. Accomodations were great. One negative some of the pots and pans were dirty and had burnt food on the bottom of the pans. Very nice location. Well stocked kitchen could use some clean up and organization. Pop cporn popper was not there. Need a new coffee pot. Need some trimming of shrubs and trees, difficult to walk in garden. Upstairs deck furniture needs replacement. Hot tub cover stand needs repair. Our daughter and her two young sons from Coronado, California, visited October 1 through 4, 2010. Due to space limitations at our home I rented WHALESoNG HOUSE for them. It was a wonderful place for them to stay and they thoroughly enjoyed the spacious house, hot tub, gardens and convenient location. They look forward to their next visit and stay at WHALESoNG. The placed was a great location and easy access to the beach. Very clean. Can't say enough good things about Whale Song. Remarkable. Photos on the website do not do justice to this place. Loved the privacy in the back yard, the spa cover was to heavy for us to put back on, other than that it was great and we will be back. Thank you for the info on cleaning. Have that taking care of.